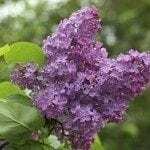 I have a small lilac in the corner of my garden and after replanting into a bigger pot and placing it a different place this summer, it has developed spots all over the leaves. It also has something white growing on the soil around the stem. I've attached three pictures. Do you know if there's anything I can do?